If you’ve been following me on Instagram, you may have noticed my new obsession hobby is screen printing with Oracal 651 vinyl. Since I shared my first screen printing tutorial, many of you have asked why I prefer screen printing over heat transfer vinyl. No… it’s not because I needed another excuse to buy craft supplies! For years I had been making heat transfer vinyl shirts with EasyWeed vinyl. It was an easy way to make personalized shirts. I primarily made shirts for my girls who would wear them a handful of times before outgrowing them. Long term wear was never that much of a concern. 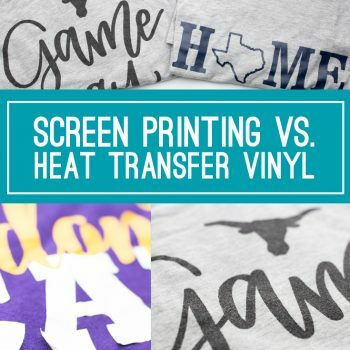 But, since we are comparing HTV to screen printing, one of the big differences I must point out is the long term wear of the shirt. Here’s a look at a few of our favorite vinyl shirts. As you can see, over time with washing they crack and the vinyl starts to peel up. HTV was my go-to shirt making process until I discovered how easy it is to screen print t-shirts using adhesive vinyl and my vinyl cutter. Screen printing with dark ink in particular, the ink just soaks into light colored t-shirts. Once the ink is dry, you can’t really feel the inked areas compared to the rest of the shirt. I don’t have peeling or cracking issues, but more importantly, I just love the way it feels. It’s so hard to explain this in pictures but here are some close ups where you can see the ink on shirts. 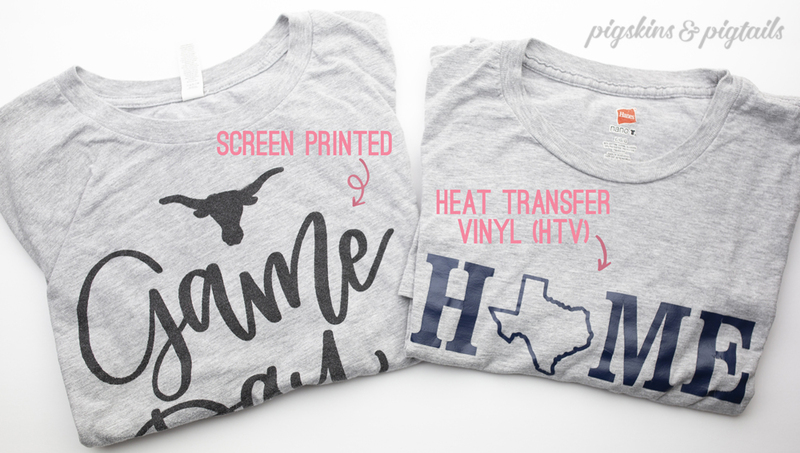 Have you tried screen printing yet? I’d love to hear your favorite – screen printing or vinyl?? Comment below and tell me what you think! 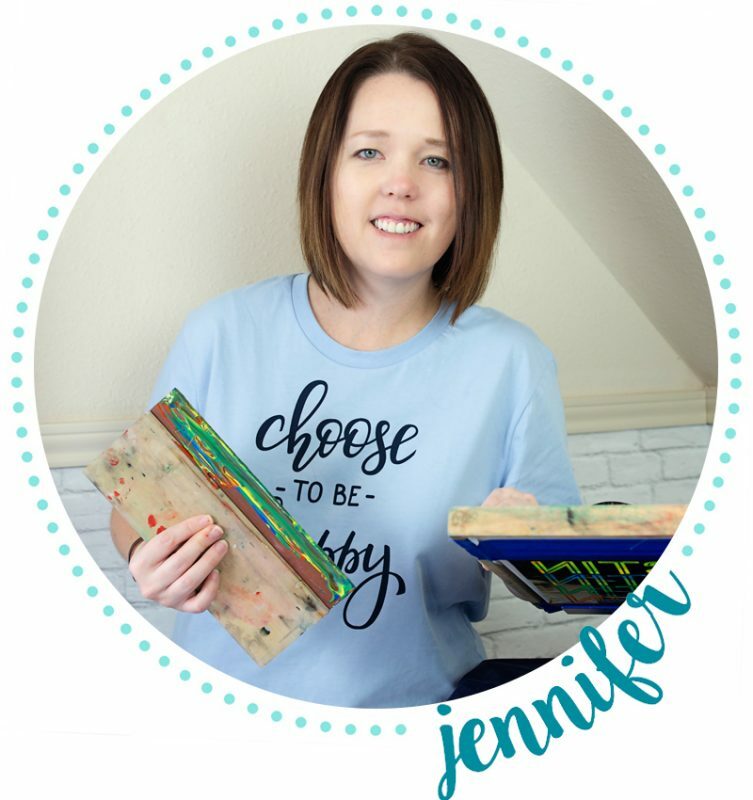 Hello Jennifer – I totally agree with you on HTV vs. screen printing. I have just started dabbling with Speedball ink and was wondering if you have noticed a difference in using black ink vs. white ink? For me, the white always looks faded, which I like, but how do I get it to look more professional? Yes, there is definitely a difference in black and white inks. White ink on a dark shirt is tricky. The best solution I have found is doing 2 coats, letting it dry in between. I have had some success speeding up the drying of the first coat using a hair dryer. You just have to be careful that your screen doesn’t dry while you are waiting on the shirt to dry! Ideally, you would let it dry overnight before applying the 2nd coat. To do this, you would want to use registration marks so you can line up the screen for the 2nd coat. Here’s a tutorial on using registration marks. You would need to cut your vinyl twice so you can wash your screen each time. Hope this helps! I plan to do more tutorials and posts about this topic soon! What brand is that large roll of transfer tape that you use? It comes in a huge roll and will last you forever! I love it…. it’s the only type of transfer tape I use!